Look for wild-caught sablefish (a k a black cod, Alaska cod, butterfish) from Alaska or British Columbia. It’s a fatty, mild-flavored fish with luscious, buttery texture (if you can’t find sablefish, use wild Alaskan salmon instead). Sablefish is delicate, so use a thin, stiff spatula to turn the fish. If the skin sticks to the pan, no worries; just use the spatula to lift the fish and leave the skin behind. Combine first 7 ingredients in an 11 x 7-inch baking dish. Add sablefish, turning to coat. Cover and marinate in the refrigerator for 20 minutes, turning after 10 minutes. Remove fish from dish and reserve marinade. Sprinkle fish evenly with salt and pepper. Heat a large nonstick skillet or sauté pan over medium-high heat. Add canola oil and lay fish in pan, skin side up. Cook 5 minutes on each side or until lightly browned and to desired degree of doneness. While fish cooks, pour reserved marinade into a small saucepan. Bring to a boil and cook 7 minutes, or until marinade is thick enough to coat the back of a spoon. 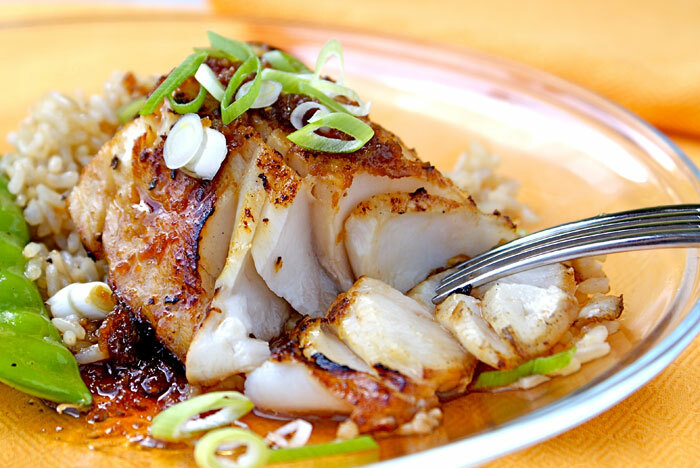 Brush fish with glaze and garnish with sliced green onions.